Paté de pommes de terre -The best potato dish recipe! I landed at Nice airport at 15.00 and went straight to work as the MIPIM congress in Cannes more or less started the same day I arrived from San Francisco. We had 7 events during 3 days so it was full on! -4 lunches, 1000 canapés and 2 dinners. Lots and lots of hard work, but everything went great so I was very happy! Throughout the years we have always offered our clients a great variation of buffets, but one dish that keeps reappearing is the french potato paté. All of our clients love it! It’s so easy to make and tastes divine! It was my friend Karolina who gave me this recipe from the beginning, and I have to say it’s THE potato dish to have on buffets! You can even make it a couple of days before your party and keep in the fridge to save all last-minute stress! Sometimes I make it with fresh herbes de provence, sometimes I make it with goat cheese, sometimes leeks.. You can basically flavor it any way you like. 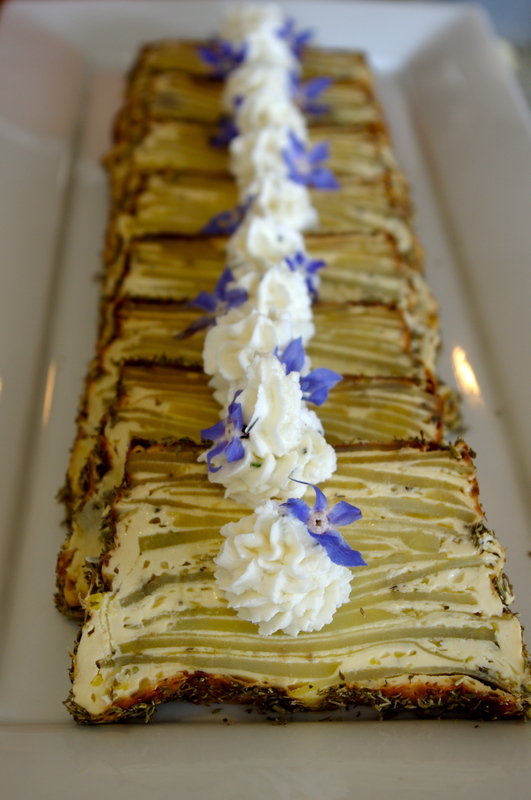 It’s wonderful to serve warm but just as delicious to serve cold on a spring/summer buffet! In a bowl add the cream and eggs with the salt and pepper and nutmeg and stir well. Add the crushed garlic and chopped fresh herbs. The potato soaks up a lot of the salt, so make sure to add a generous amount. Peel the potatoes and slice them in a mandolin. Dress your paté mould with baking paper. In layers, put the sliced potato and pour over egg cream almost like a potato gratin. Let it cook in the oven (170°) for about an hour and a half. To make sure the potato’s done, use a wooden stick. Serve warm or cold with some extra sprinkled herbs. Or as I did on the photo; with some goat cheese and rosemary crème with bourrache flowers.